A cross-Channel fast ferry has been seized in northern France in a dispute over unpaid taxes and dues. The Dover to Boulogne SpeedFerries vessel, called SpeedOne, was stopped on Thursday evening in Boulogne by the French authorities. 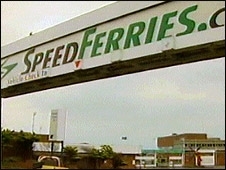 A SpeedFerries spokeswoman said no weekend bookings were being taken while the firm worked to resolve the dispute. The Boulogne Port Authority said it obtained an order enabling seizure of the ship over outstanding payments. SpeedFerries' chief executive officer Curt Stavis said the detainment was "totally unexpected" and came after the authorities had given a written assurance that no legal steps would be taken before a meeting planned on Friday morning. He said the company had been due to set out plans to resolve an impasse relating to outstanding payments. The company also had "substantial counterclaims" towards the port and over a planned rival Dover to Boulogne service. Mr Stavis said: "As the actions of the Boulogne port authorities are now proven to be unpredictable and inconsistent with their given guarantees, SpeedFerries finds itself in a position where it is unable to inform its customers, employees or business partners, of a firm date for the resumption of services. "The company deeply regrets this situation and asks everyone affected to accept our sincere apologies." The Boulogne Chamber of Commerce, which is also the Boulogne Port Authority, issued a statement which said SpeedFerries had been advised of the order for seizure "for some considerable time" but the ferry operator had "taken no measures". It said the chamber of commerce ship broker had consequently decided to seize the ship. "SpeedOne is immobilised in the Port of Boulogne until agreement is reached with SpeedFerries," it added. "The Boulogne Chamber of Commerce is open to all solutions to resolve this situation favourably and rapidly in order for the service to resume as soon as possible."